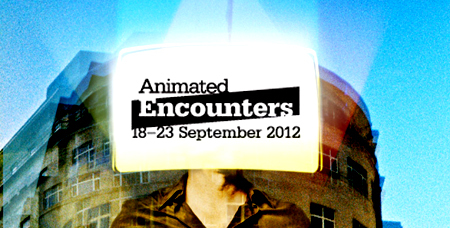 I’ve just slept off this year’s Animated Encounters, our town’s local showcase for established talents, up-and-comers and, on occasion, lucky gobshites who get their films in purely by chance. While me falling firmly into the latter category of last year’s edition saw me making a pest of myself akin to a mild dust irritation, this time around my constant presence was that of an all-body skin rash, froghopping from screening to screening to event to workshop to screening to masterclass to restrospective to scree– okay, you get it. This was down to my first outing as an ‘official’ member of the press. OooOOOoooh! You can read my day-by-day coverage of the festival over at Skwigly, with a podcast special in the same vein as our Annecy episode to come next week. Continuing our trend of sheer good fortune I was able to land a particularly awesome, high-profile guest, while simultaneously my co-host Steve managed to nab himself an equally terrific get for the episode that’ll come after. All told, we’re finding ourselves on a bit of a roll and the whole Skwigly operation is gradually morphing into a significantly bigger deal. There are several reasons for this, the main one being that Steve will be taking over the run of the ship very shortly, with myself contributing in a more expanded capacity than before. Contrary to what I’ve recently been informed is a widely-head presumption, I’m not the guy behind Skwigly, nor was I ever – in fact its first incarnation predates my own professional interest and involvement in animation by at least a year (well, sort of - it was back when I was still doing strictly mograph stuff). Since I got on board last year my role has always been limited to content producer – writing reviews, interviewing people I admire, producing the podcast and so on. In truth I was never fully aware of what the grand plan of its owner was. Sometimes I even felt that distancing myself from the ‘persona’ of the magazine would help avoid a conflict of interest. Ultimately though I’ve approached it as an opportunity it would've been foolish not to embrace, and I’m still amazed that in such a short space of time I’ve been able to talk to quite an in-depth degree with so many amazing talents and even some industry heroes. At the end of the day, either the direction or overall scope of Skwigly has proved irreconcilable with its creator’s full plate of other work and so he’ll be stepping aside to let Steve and I do with it what we will. I don’t see this leading to any changes, aside from amping up its consistency and, knock wood, broadening its appeal beyond an audience who just happen to have taste that matches mine exactly. Whatever happens, we wish Mr. Skwigly the Firste a fond ta-ra and we hope to do justice to the venture he began. HEAD OVER HEELS - Trailer from Timothy Reckart on Vimeo. 1-KALi, the little Vampire -Trailer from Regina Pessoa on Vimeo. "A Different Perspective" Trailer from Chris O'Hara on Vimeo. Phone Home from Lupus Films on Vimeo. It’s podcast time again, though this edition has been somewhat delayed for a number of vague and slightly frustrating reasons. The overall Skwigly operation has had an overhaul on the cards that will benefit all involved, including its audience, though progress on this has been halted for some reason or other. At the end of the day it’s stuff I’m simply not in the loop about so until I know what’s up I can’t really elucidate further. But I’m confident things will get pretty exciting sometime in October at the latest. Until then give this latest episode a listen and, if you so desire, download it for keepsies! There’s the usual dollops of cartoon geekery such as 90s cartoon nostalgia and Wacom Cintiq love, but as ever the real highlights are the fine folks Steve and myself get to interview. 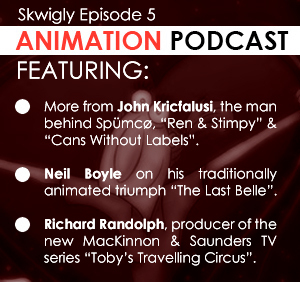 These include Neil Boyle, protégé of Richard Williams and director of the fantastic and nearly 100% traditionally animated film “The Last Belle”, along with Richard Randolph of Komixx, producer of the new kids’ show “Toby’s Traveling Circus” who has some very valuable insight into that side of the looking glass for any aspiring producers out there (who I consider myself to be amongst). Also there’s part two of my interview with John K, which I’m still over the moon about and expect I will be for a good long while to come. Now that his Kickstarter campaign has come to a successful close, this portion of our chat covers several other means of his pre-“Cans Without Labels” career, including a heartwarming tale of Bob Clampett’s…hormones. You can listen to the whole thing below or subscribe on this newfangled iTunes thingy the kids are all talking about. On a final note, I’ll be the beardy face of Skwigly at this year’s Animated Encounters, which is fairly convenient as the Arnolfini where it’s held is pretty close by. I’m in charge of pretty much all the festival coverage for the magazine so if you see me in the crows all on my lonesome then come say hi. Or just point and laugh derisively, as well you should.